Hotel Limousine: Please reserve via phone (+886-2-2542-3266 ) or e-mail ( service@royal-taipei.com.tw ) at least one day in advance by providing flight details and number of passengers (maximum 3 passengers). The average travel time is about 45 minutes. Complimentary Wi-Fi access is available in the limousine. The fee is NT$2,500 NET per way. From 2018/1/1, the fee is up to NT$2600. Taxi: The average travel time is about 45 minutes. The fee is about NT$1,300 per way. Airport Bus: Tickets are sold at the airport bus counter. The average travel time is about 60 minutes. Please take CitiAir Bus, #1961 West Bus. Get off at "Zhongshan Police District”. It is a 2-minute walk to our hotel. The fee is about NT$90 per way. For details, please refer to: T.I.A. Access Information or CitiAir Bus Information. Taoyuan METRO (MRT): Applied Taoyuan Metro(MRT), started at 12 Terminal 1 station or Stop13 Terminal 2 station and took off at Stop A1 Taipei Main Station. After arrived at Taipei Station, may take taxi direct to hotel for around 10 minutes driving and NT$100 expense. Hotel Limousine: Please reserve via phone (+886-2-2542-3266 ) or e-mail ( service@royal-taipei.com.tw ) at least one day in advance by providing flight details and number of passengers (maximum 3 passengers). The average travel time is about 15 minutes. Complimentary Wi-Fi access is available in the limousine. The fee is NT$1,300 NET per way. From 2018/1/1, the fee is up to NT$1400. Taxi: The average travel time is about 15 minutes. The fee is about NT$170 per way. Taipei MRT (subway): Take Wenhu Line, get on at “Songshan Airport Station”, transfer to Songshan-Xindian Line at “Nanjing Fuxing Station”, get off at “Zhongshan Station”. It is a 3-minute walk from “Zhongshan Station” Exit No.3. 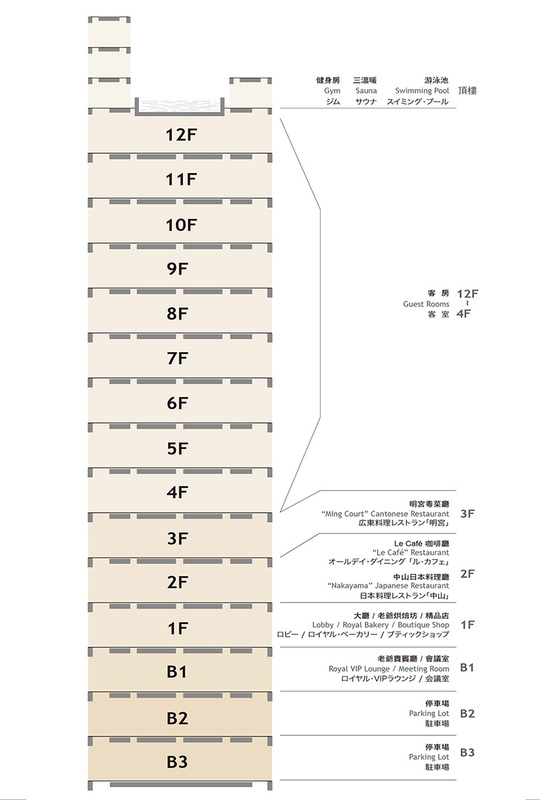 The elevator and escalator are located at Exit No.4. The fee is about NT$20 per way. The hotel is situated in a vibrant multi-national business district in Taipei. It is 20 to 30 minutes away by car from Taipei 101, Taipei World Trade Center, Nangang Software Park , and Neihu Technology Park.